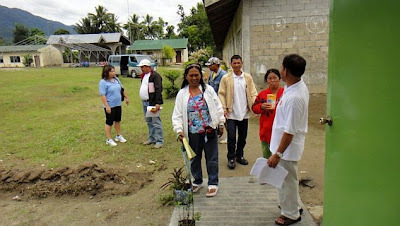 The Project Implementation Team (PIT) of the School-Based Management and Community – Collaboration for Reform in Education (SBMC-CORE) headed by Ms. Caroline Belisario, PIT team leader went in the Division of Compostela Valley on 13 June 2012 particularly in the municipality of Maragusan where 4 schools covered by the project is located. Going to Maragusan was not easy. You have to pass through a long, rugged, and winding road in order to reach the town proper. 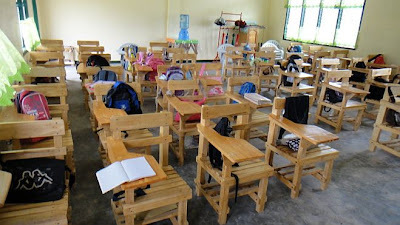 When the team arrived at Maragusan, we went to the New Albay National High School. Along our way, we needed to cross a river. Unfortunately, our vehicle stalled in the middle of the rising river. To get it out, we had to remove our shoes to push the vehicle. Given our combined strength, we only succeeded to push the vehicle near the embankment of the river. The sand beneath the vehicle was loose and the van’s tires weren’t able to get better traction. 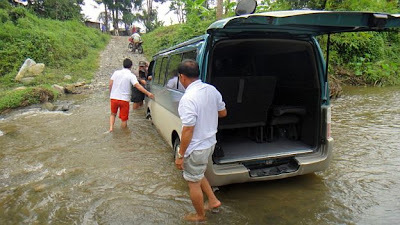 The area volunteer coordinator called for help from the barangay officials. In time, a truck came to pull our vehicle to the road. At the suggestion of the area volunteer coordinator, the PIT rode with the PTA volunteers in their motorcycles while the truck continued to rescue our vehicle. The school volunteers were waiting for us when we arrived, and monitoring orientation was conducted as scheduled. It was the school’s lunch break then and the school personnel and students also listened during the discussion. 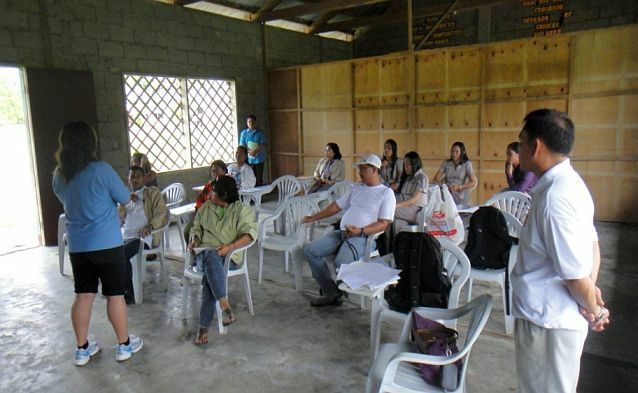 Although some volunteers were previously oriented in Maragusan Central Elementary School, we still conducted a brief orientation for the benefit of new volunteers. After the orientation, the PIT validated the beginning inventory data provided by the school principal,Ms. Zosima Retardo. During the orientation, Ms. Retardo told the group that the supplier of school furniture delivered armchairs just after the previous school clusters’ orientation on the SBMC-CORE advocacy. She was very proud to say that she did not accept the armchairs due to the information given by the PIT during the cluster orientation regarding DepEd specifications and the principal’s rights not to accept when the delivery is not in conformity with the specifications. The team’s spirit was lifted and the tiredness was lessened because of what the principal shared. According to her, the supplier returned to rectify the deficiencies after she had refused the delivery. The supplier also retouched and sanded the armchairs until these became smoother. The principal’s assertion to her rights is an indicator of a positive impact of the advocacy. Moreover, the supplier also commented positively on the initiative stating that “now, alam na naming na hindi tatanggapin pag hindi maayos.” (Now, we know that schools won’t accept chairs if these are not manufactured properly.) We hope someday that school principals like Ms. Retardo would multiply and spread the reform in Education. Mr. Rene Brasuela is a Deputy eam leader of the PH Desk of ANSA-EAP.